In my second brew for the AHA club night, I’m revisiting my Eagle Face Oatmeal Stout. 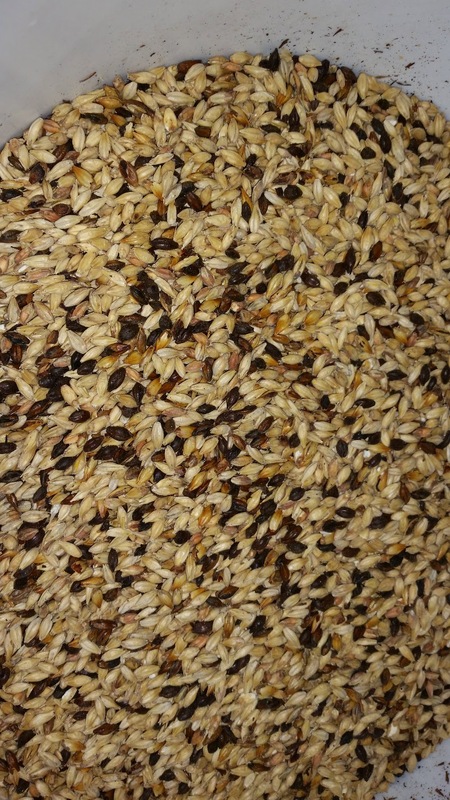 The beer recipe is pretty much unchanged, with just a touch more flaked oats to round out the body a bit. 24 hours before brewing, I began a 1L starter (4 oz. of extra light DME in 1L water), and ran this on the stir plate. True to the yeast strain (WLP002), the culture was a snowstorm of flocculated yeast by the end. I mashed in with 4.25 gallons of water at 169°, and hit 155-156° for my mash-in temperature. The mash had dropped to 155.4° after 10 minutes and was down to 152.4° after 50 minutes. After 60 minutes, I added 0.5 gallons of 170° water, let this sit for 10 minutes, vorlaufed, and collected 3 gallons of wort at ~1.070 gravity. Then, I added 3.25 gallons of water at 180°, which raised the mash bed to 168°. I let this sit for 10 minutes, vorlaufed, and collected the remainder of the wort. All together, I collected 7.6 gallons of wort with a gravity of 1.049. This works out to a mash efficiency of 81%! I suspect I collected only 3 gallons on the first round due to slow draining of the mash tun; the rice hulls were definitely a good addition to this recipe! I brought the wort to a high, rolling boil. After 5 minutes, I added the hops. After 60 minutes, the wort gravity was reading ~1.054 on my refractometer, a little bit lower than I wanted. So, I removed the hops (to avoid over-bittering), and boiled for another 15 minutes. This may have overboiled the Irish moss a bit, but I figured that was a small price to pay for hitting my target gravity. After flame-out, I chilled the wort down to 70° using my wort chiller. In the end, I had 6.25 gallons of wort, ~5.75 gallons of which went into the fermenter. Final gravity was 1.061 at 60°. This was nearly exactly at my target of 1.062. I put this in the fermentation chamber, which was set at 66°.